The Stroke and PAT scheme is a collaborative partnership between Ruth Winston Centre and the national charity Pets As Therapy. It offers stroke survivors the opportunity to incorporate a companion animal into their stroke rehabilitation treatment programme. 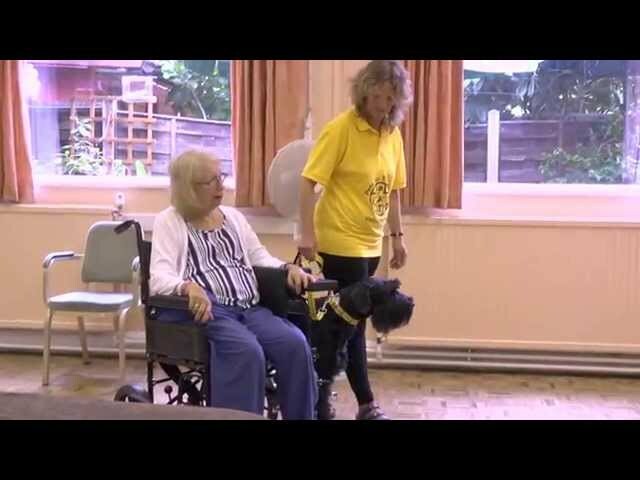 Pets As Therapy works in partnership with the lead professional Sallie Bollans of Stroke Rehab Dogs, to provide suitable volunteer PAT dog teams. to facilitate improvements in the five functional domains; physical health, emotional health, psychosocial health, cognitive function and communication skills. AAT can therefore be successfully implemented by all members of the multi-disciplinary team, (Occupational Therapists, Speech and Language Therapists, Physiotherapists and Psychologists), to work towards achieving client-centred goals with appropriate people. AAT can provide a unique opportunity to relearn everyday skills without realising the full extent of the effort being exercised. Research has suggested that "a dog may act as a unique catalyst to motivate the client to talk and provide an atmosphere of unconditional acceptance for the disordered speech that is produced" (Macauley​ B. L. 2006). For patients with communication difficulties (fluent and non-fluent aphasia), interaction with the dog offers opportunities for the production of spontaneous vocal output, together with an opportunity to repeat practised "drill type" activities with an outcome. Due to the non-confrontational nature of the interaction, anxiety levels decrease and the patient can feel encouraged to be creative and spontaneous. AAT can provide an opportunity for the stroke survivor to express assertiveness and to take control of a situation as opposed to playing a passive role. It allows the patient to be the “carer” - looking after and caring for the needs of the dog.